Age of Kings Heaven - The Blacksmith :: Civ3 units: Ayutthaya General&Elephant. 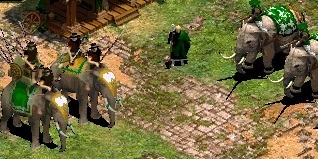 Downloads Home » Mod Packs » Civ3 units: Ayutthaya General&Elephant. Units from "Empires of the East: Ayutthaya" (by Balam-Agab). 120 frames, the "Ayutthaya General" has bonus animation. Can be used for South East Asian elephants heroes. In the screenshot Bayinnaung and Tabinshwehti. Hey Peter, may I request "Tomahawk" unit? 1. Open the FLC-file using Civ3FlcEdit or FLICster. 2. Copy the individual frames in the BMP. In the first program you can adjust the background (color), but there you will have to save frames one by one. The Teem color should be either violet or cyan. N.B.! PCX-file convert to BMP from Civ3 ImgConvert. 3. Edit with Paint, PaintNet, PhotoShop and other. 4. Convert by Turtle Pack SLP Editor. 5. Collect in the same program in a SLP-file and save. It can be done, but are you sure that the "Tomahawk"-rocket you need is so large as in Civilization III? I mean "Tomahawk" or "Mohawk Warrior" from Iroquois, https://forums.civfanatics.com/resources/mississippians-unit-pack.25806/ can you convert these unit pack? Thanks. I hope you will have some time to convert more meso units from American conquest. Maybe, meybe someday I will do it. Yes, I planned to try to convert Inca units. Can you do the aztec and other maya units too,I can really use them in my mod.